Yesterday, Pia was The Flower Pot's Birthday Girl, and we celebrated with an amazing chocolate coconut cake! It's not the same cake that we ate, but this one looks sooo good, I just had to share it with you. The Honest Cooking Food Magazine says, "there is something dark and mysterious about this cake, and the coconut blends perfectly to create a symphony of taste." Sounds great, right? Get the recipe here! If you're vegan, we haven't forgotten you: some of us here at The Flower Pot are vegan too. 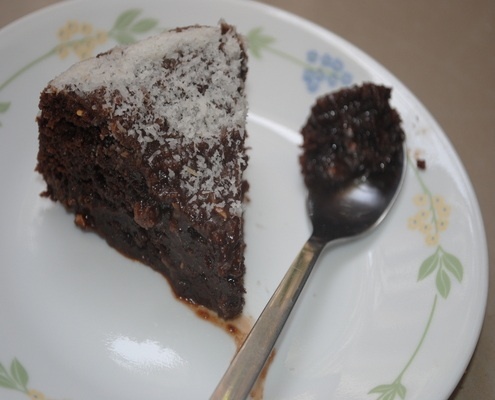 Here's great blog post with a lovely recipe for vegan chocolate coconut cake at the end. Any dieters in our midst? Here's an idea for you. The Flower Pot has a gorgeous cake made of flowers that would make a great birthday centerpiece. For extra excitement, you can get one that includes sparklers. Now that you have a recipe for a perfectly chocolatey and gooey birthday cake, we've got a couple birthday gifts you might want to grab for your own birthday girl or boy. Daisy the flower poodle will definitely draw smiles all around or a custom birthday mug for, girls, boys, or both might be what you're looking for. Add a personal message to make it really special. If you have already purchased a gift but are hoping to add something more, we are still offering six beautiful red roses for $19.95. As always, your friendly neighborhood Montreal florist is here for every occasion. Stop by our Griffintown flower shop at 1340 Notre Dame Ouest to check out our gift options, visit our website to order online, or call us at 514-938-1234 so we can give you more gift ideas!